Zya frowned as she rolled out of the hug, replying "Awww... ok, when would I be able to see you again?" giving her a slight smile. Creeping up beside her, giving her another nuzzle. "You know you don't have to go...." giving her the 'puppy' eyes, clearly he didn't want her to go. Chibi looked back at him. "I would, but I have training tommorow, and then after that I get tested to be able to see if I'm worthy to become a Guardian. I need to get some rest. I will see you agin though." She told the Skywing. She nuzzled him and gave him a hug. Prepared to walk away she stopped for a second. Zya frowned with a sad look on his face, "How will I find you again..." he whimpered, he didn't want her to leave knowing that this could be the last time he laid eyes on her. Zya sat up and watched Chib begin to walk away, he hoped to see her again after all he started to have feelings for her. Chibi turned around at the dragon. "Don't worry, we can meet again! the tunnels remember? They all lead to the same spot no matter where you enter. Besides, it will be easy to find each other again if we go through there, right?" A tear scliently ran down her face. She didn't want to go ,but she knew that she had to if she wanted to become a Guardian. Chibi then outstreached her wings, and flew off. Zya sighed, "Alright, see you tomorrow" he noticed a tear run down her face, he smiled slightly and watched her take flight. Moments later Zya also headed back to Skywing territories. The next day, it was coming up to late afternoon when Zya arrived at the meadow where they last saw each other, he began to wonder when Chib would turn up, laying under the same tree from last night, he fell asleep since last night he was up quite late from traveling back to Skywing lands. Chibi, just finished her training, and headed back. The calling was put on delay, but that didn't stop her from meeting Zyalor. She zipped, and flew all the way through the tunnels. She expected him to be hungery, so she took a stop to catch two rabbits, both large. Weighing here down, it took Chibi longer to fly through the tunnels. She threw the rabbits out through the hole she dug last night first, then popped out herself. "I'M HERE!" she called, looking for the dark dragon. Chibi responded to him with a nod. "It went food, I learned something new about guarding, well, I actually taught it to myself, I just pretended that I didn't know it to make volcanis happy." She then plopped the rabbits down, and puchs one forwards for Zyalor to eat. She scratched at her chin, for it was, itchy, then began to prepare her food for eating. Zya smiled, walking up to the rabbit he began to slice it up with his claw into sizable chunks for him to eat, lowering his head he began to gulp down the chunks. Feeling better after finishing he crept towards Chibi and rolled onto his back in the grass. Giving her a smirk, he purposely tripped her over onto him, resulting in him hugging her. "I' couldn't wait to give you a hug again all day" he smiled. Chibi blushed, then smiled. She laughed as right then she kicked him up in the air so that he landed on his back in front of her(a flop thing.). She pounced onto him and nuzzled him. "I couldn't wait to see you. Anyways, after we finish. Wanna fly?" She asked right before she leaped off of him to finish her rabbit. Chibi put its skin with the other rabbits skin under the rock. Zya frowned slightly and replied "Well we could... but I'm a bit tired from flying all day" and continued "But I do wana spend some time with you!" as he continued to hug her squeezing tighter and nuzzling her snout. "Its up to you Chib" giving her a cheeky smile. Chib looked into his eyes and gave him a warm hug. "Can we run around on the ground with our wings outstreched and pretend that we are flying? I heven't realled moved them all day. I swear I'm going to forget how to fly!" She joked as she streched out her body to get ready to run around. Zya laughed, "Sure I guess" as he got up he span in a circle getting ready to run, he suddenly tapped Chib on the shoulder yelling "Tag!" following up with him dashing away towards the large tree pausing for a moment giving her a smirk. Chibi turned around and saw him by a tree. She spoke aloud. "Oh, it's on!" She darted towards the skywing and leaped into a bush, then swiftly, and unoticably, leaped into the branch above him. She waited for his move. Zya watched as Chib darted towards him and leaped up onto a branch above him, he reacted with swiftly running towards the pond nearby, using his strong legs he jumped and bounced into a glide over the cold waters. Finally landing on the over side awaiting Chibi's chase. Noticing his move, chibi darted towards him and used her wings as gliders. Not afraid to get wet, she grabbed his paw and dragged them both into the pool behind him. "I got ya!" She shouted with glee, then quickly crawled out, since she realized that she was in water. Zya let out a yelp as he was dragged into the cold waters, causing a large splash. As he resurfaced he laughed and replied, "Yep you got me.." Falling on his back floating ontop. Noticing Chibi's scurry out of the water he followed suit and tackle jumped her leading for them to roll in the grass. Finally stopping Zya was ontop of Chibi giving her a hug. "That was fun" he smiled not wanting to let go. Chibi smiled back and giggled. "Yeah it was! Wanna do something else now before the sun sets? We could go hill rolling." She told Zyalor while hugging him back. She then rolled around so that she was on her back and could see the sky. Her blue eyes searched through it, not exactly knowing what they were looking for. A feeling burst into Chibi's heart, one that she never felt before, or remembered. Her thoughts swirrled around until it seamed like they all just went down the drain. At the moment all she wanted was to be with Zyalor. She wanted to be with him forever. Chib then nodded and smiled back. She darted for a hill and leaped. In mid air she turned on her side and landed at the top of the hill. She rolled down quickly, her wings tucked in, and a wide smile on her face. Chibi's fur was getting a little dirty, but not too much that it had to get cleaned. When she reached the bottom of the hill she let her body roll ontil it stopped. When she got up she called Zyalor over. "Come on down! It's fun!" 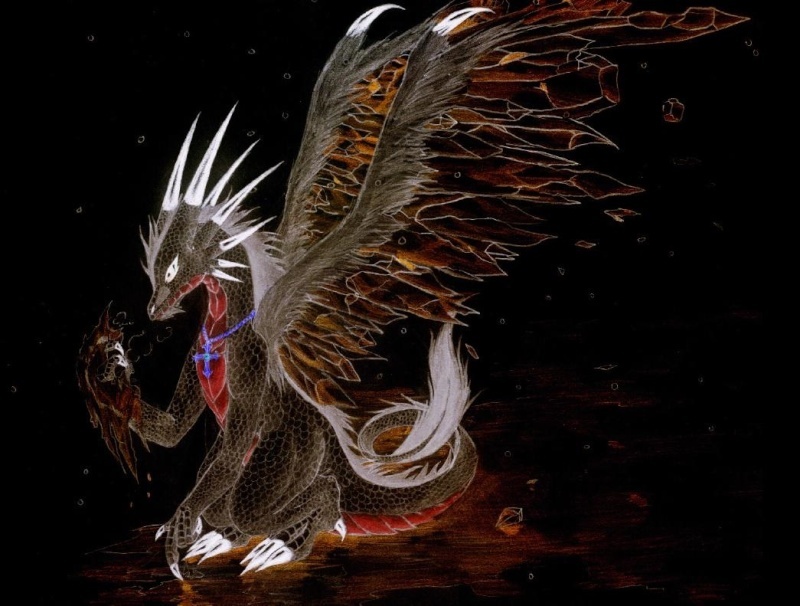 As Zya watched Chib roll down, he suddenly felt a bit nervous biting his lip he smiled and dived into a roll down the hill, also tucking in his wings his tail spined almost slapping himself. Finally slowing down into a complete stop he felt dizzy trying to get onto his feet but falling over from losing his balance, he started to laugh rolling on his back taking a moment to regain clearness. "Whoa... that made me dizzy..."
Chibi nodded. "Yeah that normally happens the first time, but I bet that the next time you will get the hand of it!" She walked up to him and gave him a hug, trying to make Zyalor feel better. Zya finally getting some clarity, he smiled returning the hug, while giving her a lick blushing slightly. "So.... what you wana do now?" he asked with a curious look. Sitting on his hindlegs, curling his tail around him awaiting for her response. Chibi placed her paw on her chin. She really didn't know. She sat there and though while making weird "hmmmmm" noises. She couldn't figure it out. She the reached it out of her mind and spat her idea out. "We could play ninja. Or maybe something else, my orld has a bunch of fun games."